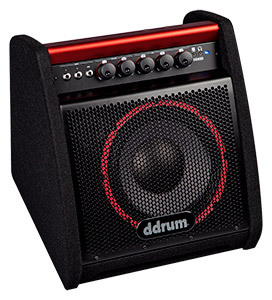 Electronic Drum Amps from ddrum are a must when you are looking to take your electronic drum kit to the live stage or playing situation. Established in 1983, we have been an Electronic Drum Kit innovator of over three decades. Today, we offer the electric drummer the option of our ddrum 200 Watt Electronic Drum Amp or the ddrum 50 Watt Electronic Drum Amp which are both featured rich for compact drum amplifiers. Let us help you achieve the sound you desire so you can dial things in your way. ddrum - Everything for Today's Drummer.